Sue (anonymous last name) has posted a fraudulent memorial on findagrave.com. Sue will not respond to a legitimate request to remove the fraud. 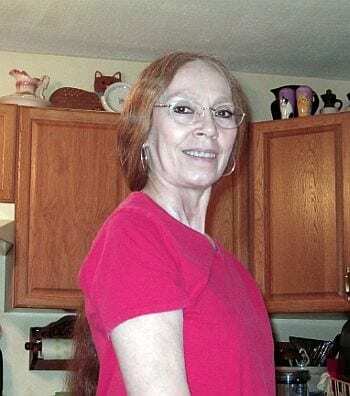 Her non-reaction calls into question the validity of any posting on findagrave.com, or the intention of its owner ancestry.com to give accurate information. 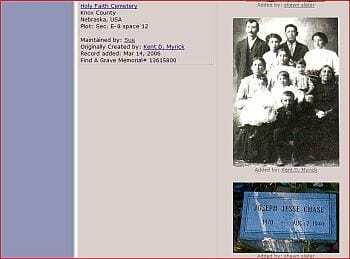 One must question, out of the almost 1,800 memorials Sue has posted and manages, how many more memorials on Find a Grave contain fraudulent information that can’t be trusted? Sue describes herself so: “I’m a Mother of 4 adult children, (is that an oxymoron?-lol) 2 sons, 2 daughters. I have 11 marvelous grandchildren, a fantastic, loving husband whom I’ve been married to for 40 yrs. on Sept. 21, 2014. And now our first Great Grandchild, Gysele Mei has arrived at 28 wks. She’s doing well so far. I’m the oldest of my 2 sisters & one brother. I’ve been a laryngectomee since Nov. 1999. Oh ya, I’m a redheaded Indian gal. The issue of Sue’s fraud is clear. 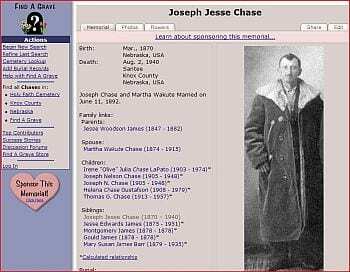 Sue’s memorial of Joseph Jesse Chase claims Chase is a son of America’s iconic outlaw Jesse Woodson James. This claim has been known to the Jesse James family for years. The claim always has been denied. No one among Chase’s descendants has ever provided any credible evidence to substantiate the Chase claim. After a dozen years of genealogical research, and the expenditure of a quarter million dollars, the Jesse James family has gone out of its way to identify who actually is related to Jesse Woodson James. Extraordinary findings were made by documenting the Jesse James family, followed by genealogical research into the in-law families of the James, and then into others related by extension from those in-law families. Research went so far to study the genealogy of most anyone who was known to have contact with the James. Historically, there have been literally thousands of claims of kinship to Jesse Woodson James, and to his brother Frank James. Not one ever has been proved. Even today, Stray Leaves receives two or three claims per month on average. Like Sue, few claimants reply to a request for evidence. 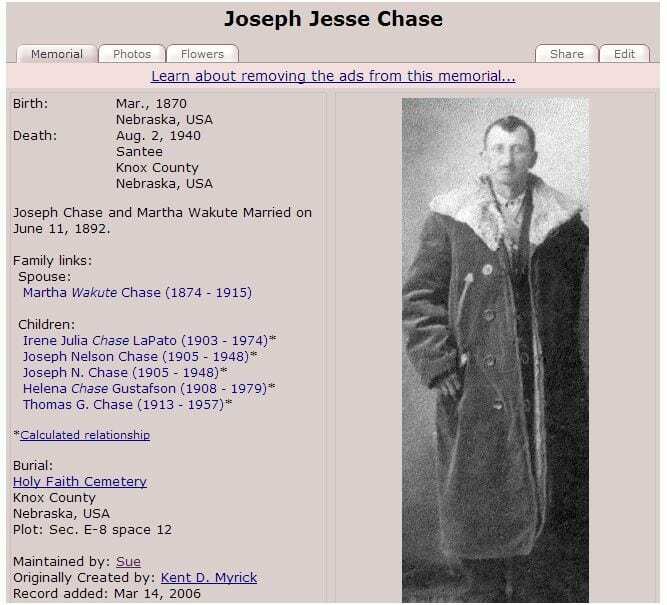 A reasonable assumption implies that Sue Anonymous likely is a relation, if not an actual descendant, of Joseph Jesse Chase. Sue assumed management of this Find a Grave memorial following its abandonment by Kent D. Myrick. Complaints to Myrick from members of the Cole and Graves families, who are legitimate relations of Jesse W. James, resulted in Myrick’s desertion and the subsequent assumption by Sue Anonymous. The email request sent to Sue, pictured here, also met with no response. Sue’s lack of courtesy in not providing any kind of response whatsoever is evidence enough of her non-responsibility. Former requests made to findagrave and ancestry.com by a complainant from the Graves family also met with a lack of responsible action. Without evidence, the memorial posting by Sue, that is supported by findagrave.com and ancestry.com amounts to fraud. It shouldn’t be expected that Sue would permit this message on her findagrave pubic profile. 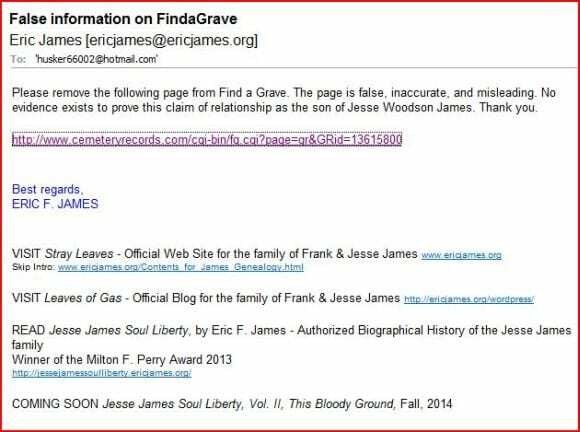 However, with regard to Jesse Woodson James and the James family, Stray Leaves will continue to publish the identity of con artists, bogus history, fake genealogy, inaccurately identified images or artifacts, false claims, inaccurate information, and fraud when it is encountered. This memorial to Joseph Jesse Chase is a fraud. After almost two years, the Find a Grave memorial above has been corrected. The present memorial removes the names of Jesse Woodson James as a parent of Joe Jesse Chase. Focus also was brought by the National Genealogical Society which brought this issue to public attention on Facebook. The corrected Find a Grave memorial that removed Jesse Woodson James as a parent of Joe Jesse Chase.